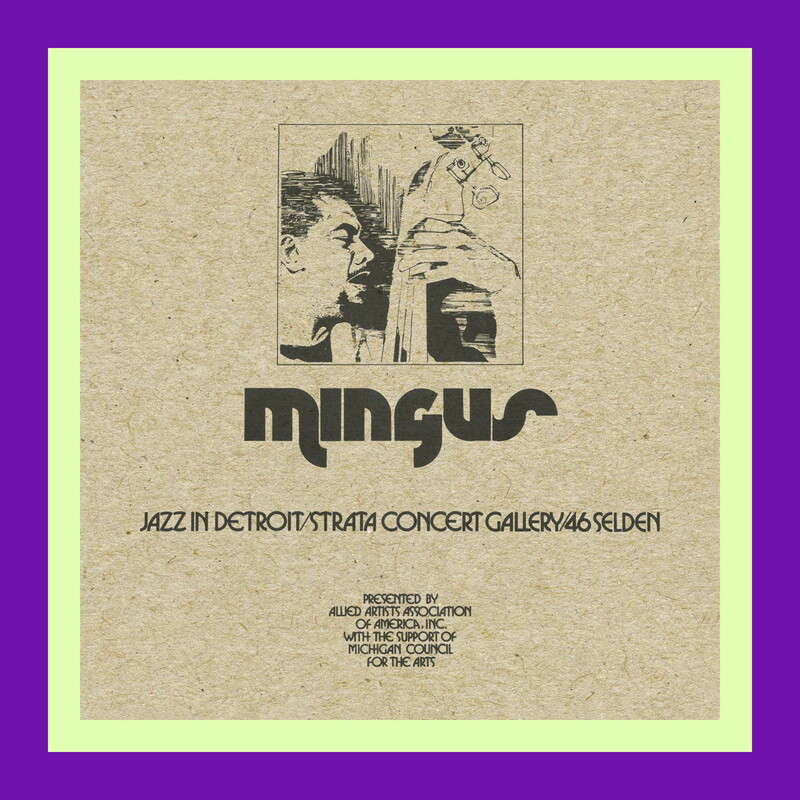 Jazz Profiles: Charles Mingus 'Jazz in Detroit,' 1973 a new box set features nearly 4 hours of excellent material recorded on a single night. Charles Mingus 'Jazz in Detroit,' 1973 a new box set features nearly 4 hours of excellent material recorded on a single night. “If you’re going by the bare facts alone, Jazz in Detroit / Strata Concert Gallery / 46 Selden is strictly for Charles Mingus completists. The new five-CD set includes nearly four hours of previously unreleased live material by the legendary bassist, all recorded on a single night in February 1973 for Detroit public radio. Unlike, say, John Coltrane’s recently unearthed Lost Album, Jazz in Detroit doesn’t date from a pivotal period in the leader’s career, feature an iconic lineup or introduce a wealth of unfamiliar repertoire. But what looks marginal on paper turns out to be sheer joy coming out of the speakers, thanks in large part to Mingus’ lesser-known yet enormously gifted sidemen: tenor saxophonist John Stubblefield, trumpeter Joe Gardner, pianist Don Pullen and drummer Roy Brooks. Even Mingus aficionados likely won’t have heard this exact lineup, since only Pullen and Brooks worked with the bassist for more than a few months. Still, as heard in these performances of Mingus staples (“Pithecanthropus Erectus,” “Peggy’s Blue Skylight,” “Orange Was the Color of Her Dress, Then Blue Silk”) and a couple rarities, their grasp of the core elements of the bassist’s sound world — earthy swing; lush ensemble playing; roomy, impassioned solos — is extraordinary. Pullen in particular nearly steals the show. The pianist would later become a star of the jazz vanguard, but at the time of Jazz in Detroit, one of his earliest documented performances with Mingus, he was still an up-and-comer. His prior experience playing everything from high-energy free improv to deep-pocket soul-jazz came in handy here. On “Celia,” a tender, melodious piece that dated back to 1957, his solo moves from crisp bebop to clanging, cyclonic expressionism and back, recalling the astounding technique of earlier Mingus pianist Jaki Byard. Later, underneath Stubblefield’s solo, the pianist tosses little firecrackers of abstraction the saxist’s way, urging his bandmate toward increasingly ecstatic peaks. And on a lengthy version of Duke Ellington’s “C Jam Blues,” he leads Mingus and Brooks into a wild free-jazz interlude. The set’s more conventional moments are just as satisfying. “Dizzy Profile” — a piece apparently written for Dizzy Gillespie but not found on any other known Mingus recording — gives the players a chance to stretch out on an old-school ballad. Pullen plays a gorgeous rubato intro, leading into a dreamy, vocal-like theme led by Gardner. Solos by the trumpeter and Stubblefield show off each player’s timeless laid-back lyricism. Likewise, on the 26-minute “Noddin’ Ya Head Blues,” the whole band digs heartily into Mingus and Brooks’ slinky groove. (Late in the performance, the drummer puts down his sticks for a charmingly folksy turn on musical saw.) These pieces show that while many of Mingus’ peers had embraced plugged-in fusion by ’73, the bassist was still more than content with the fundamentals of acoustic small-group jazz. Beyond the music itself, which sounds generally excellent for a live recording, Jazz in Detroit also has added historical value. A series of between-set radio segments interspersed with the music offer a window into the lively Detroit scene jazz at that time. We hear MC Bud Spangler, broadcasting from on site, giving directions to the Strata Concert Gallery — the home of Strata Records, an important local label of the period that DJ and Jazz in Detroit project coordinator Amir Abdullah has spent years researching and reviving — offering free admission to anyone who can bring a backup amp down to the show, bemoaning the sparse attendance and plugging upcoming installments in the Jazz in Detroit series, which also featured Herbie Hancock, Keith Jarrett and hometown luminaries like the Contemporary Jazz Quintet, for which Spangler was the sometime drummer. Spangler also sits down for an extensive interview with Roy Brooks. Mingus’ then-drummer was a Detroit local and, as heard on this set, an outstanding player who by this time had also worked with jazz A-listers such as Wes Montgomery, Pharoah Sanders, Jackie McLean and Horace Silver. (Jazz in Detroit is sourced from Brooks’ own tapes, provided by the drummer’s widow, Hermine.) He describes the challenge of performing Mingus’ “very demanding” music — no doubt more so because Brooks was stepping into a role most often occupied by the bassist’s longtime drummer and musical soulmate Dannie Richmond — and the evolving audience for jazz at the time, marked by an influx of young fans who “a couple of years ago were really into the acid-rock scene.” His generally optimistic tone runs counter to the standard wisdom that jazz was on the rocks in the early Seventies.